As many companies cut training budgets to survive the prolonged global recession, other companies are maintaining or even increasing their training programs in spite of budget restrictions. Saskatoon Health Region, a hospital system in western Canada, is maintaining its training program, which has produced 50 internal leaders since its inception in 2008. The program identifies potential leaders within the hospital, who then participate in coursework such as assessment, collaboration, employee coaching, team development, and “systems thinking,” which examines the interactions among departments and business functions within an organization. Another company that has maintained its leadership development during the recession is Bostik Inc., an adhesives manufacturer based in Wauwatosa, Wisconsin. CEO Mike Klonne and his executive team launched a “Community of Leaders” initiative that targeted 100 directors, site managers, and other leaders, totaling about 10 percent of its 1,000 U.S. workers. These emerging leaders interact regularly, sharing information and establishing a rebound strategy for the company, which has had to close three U.S. manufacturing plants in the past two years. An essential part of the plan includes a communication strategy to keep employees informed of current business situations and Bostik’s plans for surviving the downturn. During the recession, many relatively new employees have seen themselves promoted to managerial ranks more quickly than they would have in the past. In 2002, the average manager had been at his or her job for 2.7 years, according to Brian Kropp, a consultant with the Conference Board in Arlington, Virginia. By 2009, a manager’s average job duration was 11 months. 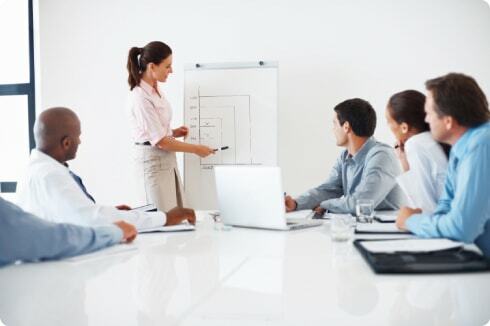 Focused leadership training can help these managers improve their performance and employee engagement, including the use of communication, coaching, setting expectations, and recognition. According to a report by the Conference Board’s Corporate Leadership Council, “Managing in the Downturn,” 21 percent of employees are now “highly disengaged” at work, up by nearly threefold since 2007. At the same time, the number of employees that have achieved high levels of effort has been halved, corresponding to a sharp decline in managerial effectiveness. The percentage of organizations considered effective at providing high-quality managers fell from 35 percent in 2006 to 25 percent in 2009, based on a survey that included about 50,000 employees on five continents. Despite such findings, many companies are hesitant to invest in management and executive training in any economy, as organizations frequently are dissatisfied with the outcome, says Rick Maurer, an independent consultant on change management. This may be, in part, because organizations mistakenly consider training as a way to restore order, although it should be considered a way to begin and implement changes. A limited number of companies, during this recession, have actually invested in employee engagement training and leadership development courses, but those that have maintained their investment in these areas are proving to be even more competitive.